Gordon Ramsay Dash’s farm market plays an important role in making prep kitchen recipes for VIPs. 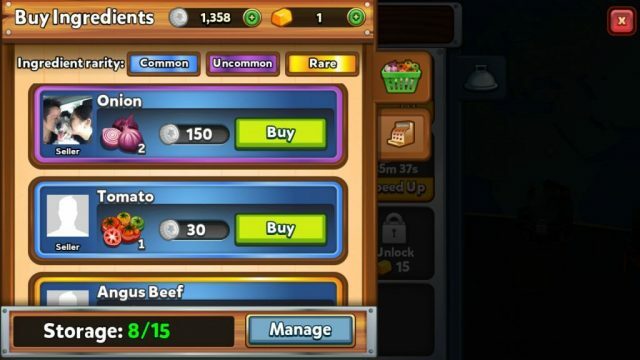 These special recipes fetch big payouts and fame, which unlocks more VIPs, sets, chef duels and several new features. You may also get gold bars, although the chances are low. You will need certain ingredients to prepare them. For example: To prepare “Cioppino”, A VIP recipe, you will need 2 onions and 3 tomatoes. 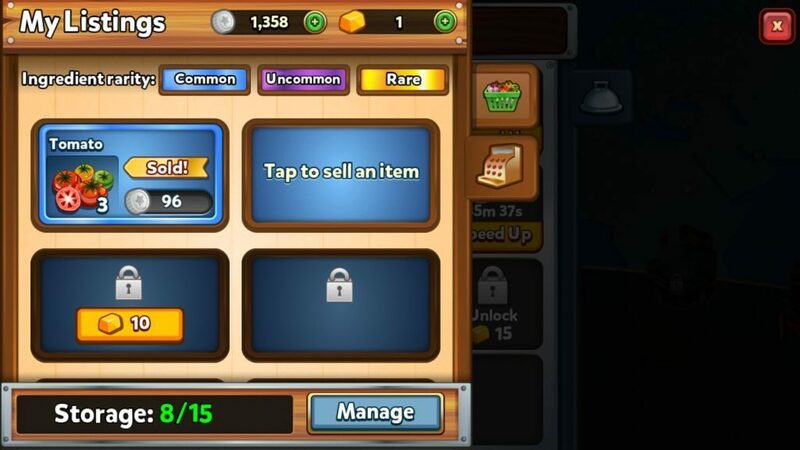 You could usually get ingredients when you leveled up or earned certain trophies, but with the help of market, you can easily buy or sell them using coins any time. Farm market unlocks when you reach level 10. You can access it via the Kitchen menu, which is located on the lower-left corner of the screen. On the kitchen window, tap the green button beside “Prep Kitchen” to access the market. Make sure you buy those that you need the most. So if you are short of garlic for the Colossal Calzone recipe, just search for it under the green basket tab and press the “Buy” button. There’s a shortcut to buy ingredients at the market. All you have to do is tap Kitchen and then tap the tiny grayed out ingredient icon under each prep kitchen recipe. You will be taken to that ingredient on the buy section. Never discard ingredients that you have in plenty or don’t need any more. You can always sell them for extra cash. Go to farm market and then tap the cash register tab, which is located below the basket tab to sell ingredients. You will see two empty slots. Tap a slot and then choose an ingredient that you want to sell. A new tab will slide to the right side of the screen. You can set the quantity and the price per quantity on that tab. You can unlock additional slots using gold bars. Tip: Don’t set any random price. Go to the buy section of the market and check what price other players are offering for the same ingredient. You can either set the same price or a lower than what a seller is already offering if you are in need of cash and want to quickly sell that particular ingredient. However, don’t settle for a low price for rare and uncommon ingredients. The background color of an ingredient reveals its rarity. If there’s a blue background, then that ingredient is common. For uncommon ingredients, the color is purple and for rare items, it’s gold. Rarer items fetch higher price. You can discard or remove ingredients by tapping the “manage” button and then selecting an ingredient, but I would recommend not doing this, when you can sell them at a profit.